Problems With ‘Silver Bullet’ Speed? 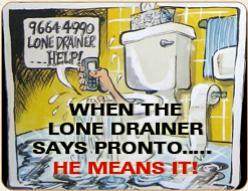 With the speed of a silver bullet, The Lone Drainer and Pronto will come to your rescue and fix your blocked drains, leaking taps and toilets, or any other plumbing or gas problem that’s plaguing you – with a minimum of fuss and without leaving a mess! What to expect when you call: over the phone, we’ll let you know how to address your emergency until we get there: how to shut down a gushing water pipe or water heater, how to shut off a gas main so damage and danger will be minimal. And, before we start your job, we’ll supply you with our legendary “no surprises, fixed price quote”, so you won’t be wringing your hands wondering about the cost. With 40 years’ experience, our technology and training is so rock-solid that other plumbers seek our advice! Our service area covers Sydney’s Eastern suburbs, Inner West, City and Lower North Shore. Is your plumbing aging – or aged? Then it’s just a matter of time before you’ll be saddled with burst pipes, blocked drains, leaking taps or toilets. Don’t wait for an emergency. Be proactive. It’ll cost you less. Check your owner’s manual for the expected life span of your water heater. Is it nearing its expiration date? It can become dangerous or flood the area if it isn’t replaced on schedule. How do the gas fittings look on your room heaters and barbecue? If they need replacing, don’t wait. Think ahead. Cut off your future headaches at the pass! And as an added bonus, when we rescue you or your family from a plumbing emergency today or in the future, we’ll give you a free Lone Drainer and Pronto sink plunger so you can immediately put into practice some things we’ll show you about maintaining your own plumbing.